Key books and reports on climate change and the media, 2003–2011 (Part 1). Media coverage of climate change has been a significant factor in shaping public perceptions and attitudes toward the issue. The first book-length studies of this coverage appeared more than a decade ago, at a time when climate change was just beginning to gain prominence and when many print and television news operations still had reporters assigned to science and/or environmental beats. In the years since, as both the climate and the news room responded to changing conditions, the pace of such reports increased. To provide perspective on the strange news world in which journalists and citizens now find themselves, Yale Climate Connections offers this historical review of the key books and reports on media coverage of climate change – in two parts. Part 1 covers the years 2003 to 2011. Part 2 covers 2012 to the present. The earliest books and reports offered guidance to reporters on how to cover climate change. But the focus quickly shifted to academic and NGO studies on the coverage journalists and their news organizations were actually delivering to their readers and viewers. The twelve books and reports featured below have been listed in chronological order. The descriptions of these books and reports have been drawn from copy provided by their publishers or, in one case, by a review of the publication. In the fourth edition of ELI’s landmark book [the first edition was published in 2003], editors L. Jeremy Richardson and Bud Ward* have created a guide for journalists – both reporters and editors – to help them understand and report on the scientific issues related to global climate change. Initially conceived to be exclusively for the members of the media, it has evolved over time as a resource also for formal and informal climate science educators and for other communicators needing a “plain English” grasp of climate science. For reporters who are generalists rather than specialists in science or environmental writing, this guide provides an in-depth look at what we do know – and still don’t know – about climate change, all in nontechnical terms. Media Coverage of Climate Change provides a comprehensive survey of the role of the media in informing and communicating climate change. [It also] looks at how media coverage has shaped discourse and action – in complex, dynamic and non-linear ways – at the interface of climate science and policy. These interactions are delineated through work that has been undertaken in the United States, Canada, the United Kingdom, France, Germany, Japan, New Zealand, Australia, Honduras, Mozambique, Jamaica, Sri Lanka and Zambia, and through explorations of newspaper coverage in forty English-language newspapers in seventeen countries, across five continents. Through these examinations of media coverage of climate change, links are made to related work on public perception and the relationship to international assistance. Scientists and journalists have been known to talk past each other, both using language rooted in professional shorthand. But when it’s time to make deadline, these two groups need to make clear, accurate and meaningful contact. A series of highly interactive workshop dialogues funded by the National Science Foundation [provided the material] for this new resource guide for editors, reporters, scientists, and academics. Written by Bud Ward, a veteran environmental journalist and journalism educator who currently serves as editor-in-chief for Yale Climate Conections, Communicating on Climate Change offers important tips and tools for covering one of the most complex issues of the day. Climate Change and the Media brings together an international group of scholars to discuss one of the most important issues in human history: climate change. Since public understanding of the issue relies heavily on media coverage, the media plays a pivotal role in the way we address it. This edited collection – the first scholarly work to examine the relationship between climate change and the media – examines the changing nature of media coverage around the world, from the USA, the UK, and Europe, to China, Australasia, and the developing world. Chapters consider the impact of public relations and fictional programming, the relationship between public understanding and media coverage, and the impact of the media industries themselves on climate change. 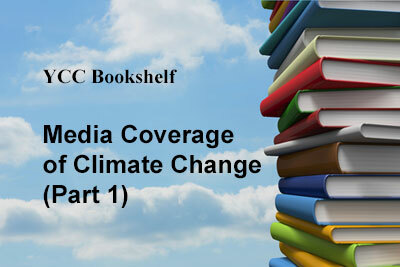 At a time when governments must take action to alleviate the catastrophic risk that climate change poses, this collection expertly details the pivotal role the media plays in this most fundamental of issues. Conflict over issues such as climate change, toxic waste and wilderness provides a key site for examining the shaping and negotiation of public debate. This book offers a new understanding of the relationship between media roles and environmental futures, and of the ways in which news works to influence environmental decision-making across boundaries and over time. Media and Environment argues that news maintains a central role in environmental politics. As such, it asks about our understandings of place and community, of local responsibility and global citizenship, and how communication as a society on these crucial issues affects our lives, now and into the future. The December 2009 summit on climate change in Copenhagen was remarkable not because it ended in an ambitious deal to curb greenhouse gas emissions but because of the unprecedented number of journalists, delegates, NGOs and scientists present. In this wide-ranging study, James Painter has produced a detailed analysis of the coverage of the summit across the globe by studying more than 400 articles published in two print media in 12 countries. The analysis reveals that articles written principally about the science of climate change represented less than 10 per cent of all those surveyed. The study makes extensive use of official UN figures to produce the first detailed assessment of who actually attended Copenhagen. It also includes a survey of over 50 environmental journalists and scientists across the 12 target countries post-Copenhagen to ascertain how they think climate change science might be best communicated. The description below was drawn from a 25 April 2011 Time column by Bryan Walsh. * The cap-and-trade campaign was backed by powerful progressive foundations that donated hundreds of millions to environmental groups between 2008 and 2010 – and those philanthropists, like their conservative counterparts, had highly strategic and disciplined aims. * Mainstream news coverage – New York Times, Washington Post, CNN.com, Politico and Wall Street Journal – of climate change in 2009 and 2010 actually represented the general scientific consensus on the issue: that global warming is real and that manmade greenhouse gas emissions are a main driver. The idea that the media has engaged in “false balance” in reporting on climate change is, in Nisbet’s view, false. * While conservatives have been justly accused of politicizing climate science, Democratic leaders have also played a role in widening the political divide on the issue. The public rely upon media representations to help interpret and make sense of the many complexities relating to climate science and governance. Media representations of climate issues – from news to entertainment – are powerful and important links between people’s everyday realities and experiences, and the ways in which they are discussed by scientists, policymakers and public actors. A dynamic mix of influences – from internal workings of mass media such as journalistic norms, to external political, economic, cultural and social factors – shape what becomes a climate “story.” Providing a bridge between academic considerations and real world developments, this book helps students, researchers and interested members of the public make sense of media reporting on climate change as it explores “who speaks for climate” and what effects this may have on the spectrum of possible responses to contemporary climate challenges. Poles Apart is a wide-ranging comparative study on the prevalence of climate scepticism – in its various forms – in the media around the world. It focuses on newspapers in Brazil, China, France, India, the UK, and the USA, but it includes an overview of research on the media of other countries. It concludes that climate scepticism is largely an Anglo-Saxon phenomenon, found most frequently in the US and British newspapers, and explores the reasons why this is so. The study also examines whether climate sceptics are more likely to appear in right-leaning than left-leaning newspapers, and in which parts of a newspaper their voices are most heard. Poles Apart includes a detailed survey of several hundred articles in ten British national newspapers to see where climate scepticism is most to be found, and which individual sceptics and organisations are most quoted. The first of a two-part analysis of Australian press coverage of climate change, A Sceptical Climate – Climate Policy, found that between February and July 2011 negative coverage of the proposed carbon policy across 10 major newspapers outweighed positive coverage by 73 per cent to 27 per cent. The second report, A Sceptical Climate – Climate Science in Australian Newspapers, released October 2013, addressed the question of balance in science news reporting. Is the selection and treatment of sources and the representation of viewpoints and evidence fair, accurate and balanced? The project behind the two volumes aims to provide more information about the quality of reporting on climate change in Australia. On September 21, 2011, David Roberts participated in The National Climate Seminar, a series of webinars sponsored by Bard College’s Center for Environmental Policy. Then a Senior Staff Writer at Grist, one of the web’s most popular sites for environmental news and commentary, Roberts argued that environmentalists’ traditional criticism of climate change coverage – namely that journalists describe global warming as a debatable theory rather than as fact – is no longer the issue. Most media accept the reality of climate change – but it is treated as a specialty issue, rather than as a phenomenon that affects myriad aspects of life. The seminar focused on how to change that perception – how to make climate a backdrop to the political debates that affect real change. *Editor’s Disclosure: Ward is the Editor of Yale Climate Connections.